Over the past 75 years, Pennsylvania-based Kennametal Inc. has earned a solid reputation in the global marketplace as a leading industrial technology company providing innovative wear-resistant products, application engineering, and services backed by advanced material science. The company’s 13,000 employees conduct business in more than 60 countries and focus on meeting customer needs in aerospace, energy, industrial production, earthworks, transportation, and infrastructure market segments. With a highly diversified portfolio representing thousands of products, there’s a constant stream of activity cycling through the corporate legal department. Someone has to safeguard the company’s valuable Intellectual Property (IP) around the world. The department’s role changed significantly a few years ago when Kennametal chose to adopt innovation as a core value. In practical terms, the shift in focus became a catalyst for product development and resulted in a market-leading effort to ensure that 40 percent of annual sales would come from new offerings. In short order, the normally-busy department’s IP responsibilities accelerated beyond anyone’s expectations. Larry R. Meenan, Chief Counsel for Intellectual Property at Kennametal, faced the challenging assignment of finding a solution to handle the growing legal workload coming from the constant innovations and new intellectual property. Mr. Meenan quickly determined changes were necessary. Legal costs were continuing to rise, and the group’s reliance on outside legal firms also was growing. 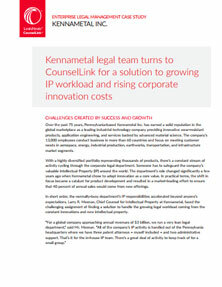 While Kennametal’s global reach made outside support a necessity – especially for IP matters beyond U.S. borders – the outside counsel list was close to 200 firms. In preparing for a new year, the group applied lean management techniques to assess their situation and also used value-stream mapping to look at departmental processes and workflows. The approach started to identify ways to eliminate waste and save money, quickly honing in on the whole invoice and billing cycle part of the equation. Workload volumes, multiple firms, and an ongoing stream of invoices combined to make that paperwork-intensive activity a logical target to address. If the group could “follow the money” better, they’d gain increased visibility into their legal spending, know how costs and values were aligning, and identify process elements to simplify operations. After evaluating several alternatives, the group selected the CounselLink solution from LexisNexis as the best solution. That decision was an important project milestone since product capabilities clarified some additional changes the department was already considering that would affect its outside firms. Three key elements became the foundation for Kennametal’s new way of doing business. Embrace CounselLink: The matter management and e-billing solution became the default way for invoices to be accepted, reviewed, processed, and paid. Outside firms were strongly encouraged to support electronic processing and to minimize paperwork. Conform to Billing Guidelines: In collaboration with the outside firms, the IP group established new rules for billing terms and arrangements, such as how to compensate for meals or travel in different cases, or when hourly rates would apply versus alternative billing methods. Clarify Fixed Fee Offerings: To make comparisons easier and gain more cost predictability, the team asked for standardized rates on IP legal work in commodity-type service categories: file a patent application in country “x” or conduct a trademark inquiry in these locations. With a comprehensive new software capability and revised rules of engagement, Mr. Meenan’s team began phasing in the CounselLink solution and operational changes. After six months of activity, the group took stock of its preliminary results. “Culling through our 200 firms was not a primary objective of the plan,” affirmed Mr. Meenan, “but it happened as a byproduct of technology change, new billing rules, and natural attrition. We anticipated some losses and worked hard to retain the strongest and highest-value relationships. We’re very pleased with the 30 firms we have now. Admittedly, the smaller group is simpler to manage. As the docketing system creates a unique matter file, a corresponding unique billing matter is created in CounselLink. Security features restrict billing and invoice activities to designated counsel only. CounselLink automatically reviews electronic invoices for compliance with billing guidelines and rules. If discrepancies are noted, items are flagged for review or automatically deducted. Every month, Accounts Payable receives an automatic report for uploading into AP processing systems for vendor payment. Additional attorney reports highlight matters, costs, and value based on legal spending. The general legal department also decided to join the effort being led by Mr. Meenan’s IP group and take advantage of the new capabilities and results. Although the general staff is a little bigger – four attorneys in the U.S. and three others covering regional interests from Germany, Singapore, and India – their invoices and outside costs are only a fraction of the total. In a six-month span, they generated just over 15 percent of the invoices, and less than four percent of outside firm costs. Two key metrics for that same timeframe indicate the overall legal department processed 2,426 invoices, and automatically captured $32,300 in invoice reductions. Mr. Meenan expects a bigger total for the year. “On an annualized basis, we estimate hard and soft savings will top $93,000, and more than $70,000 of that total will be hard savings from the CounselLink automated invoice review spotting billing guide violations that would normally slip through unchallenged.” The balance is based on soft savings tied to process changes, eliminating paperwork, and reduced administrative and AP costs. Every day, Kennametal’s IP legal team is proving that the innovation attribute exists outside of product development activities. In setting out to follow the money and find better ways to deliver value fo their company, they discovered real cost savings and efficiencies for more than just the IP team. Kennametal is a leading industrial technology company providing innovative wear-resistant products, application engineering, and services backed by advanced material science for customers in aerospace, earthworks, energy, industrial production, transportation, and infrastructure. With 13,000 employees serving more than 80,000 customers in 60 countries and a corporate commitment to innovation, the company has a goal to ensure 40 percent of annual sales come from new product offerings. A small, three-attorney legal team at headquarters is responsible for safeguarding all the company’s intellectual property. The combination of a global footprint and focus on innovation caused a dramatic increase in IP workload, greater reliance on outside counsel around the world, and growing legal costs. The billing and invoice processing activities alone were becoming a major challenge. After an examination using lean management techniques and value-stream mapping, the team evaluated several matter and legal spend management alternatives. The IP team selected CounselLink as the best solution based on its automated billing/invoice features that reduce manual processing, ability to integrate with the group’s docketing system, security features that protect sensitive legal and financial details, and that it’s cloud-based, reducing the company’s dependence of IT support. • Annualized savings are estimated at $93K, mostly from capturing billing guideline violations. • The technology change served as rationale to rework processes and outside counsel arrangements, reducing the number of firms from 200 to 30 within six months. • Outside firms are pleased to be getting paid faster and more accurately. • New billing guidelines and rules helped restrict price/ cost increases. • Mandate for and adoption of electronic processing saves four and a half days of administrative work every month with elimination of coding, scanning, printing, and paperwork handling. • Accounts Payable (AP) saves money on every invoice they don’t have to process with keystrokes. An automatic report is uploaded to AP for processing and vendor payment. • The AP group is handling the increase in IP matters and maintaining quality with a flat budget.